Info "A good tune to whistle as you run up the stairs." One Step at a Time is Jimmy T.'s boss microgame in WarioWare: Twisted! 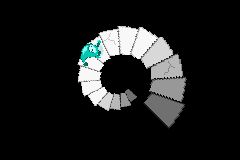 The player controls a character who appears to be in a light blue bean costume, who has to climb up to the top of a flight of stairs. However, if one stays there too long, a frog will climb up the stairs, and knock the player off if the frog touches them. 1st level difficulty: Cracked floors appear and, if stepped on, causes it to crumble. When the frog passes these, it just jumps over the gap. A floor tile that moves in and out also appears. 2nd level difficulty: At the beginning, there is a floor tile that moves in and out, and after that is a tile that opens and closes, and the player has to pass when it is closed. Then, cracked floors appear, but the dark black ones break immediately when stepped on. After making it up past a certain point, a snowball will come and roll down. One will have to crack one of the floor tiles, and the snow ball will fall down. The rest of the flight of stairs is the same as Level 1 past this point. 3rd level difficulty: This one has a twist, one will have to race a bug up to the top of the stairs. The frog is not in this level, though. This page was last edited on November 17, 2018, at 03:08.